About 35 years ago, my longtime friends Don and Ann Jackson—travel writers and, in Don's case, President Emeritus of the International Food, Wine and Travel Writers Association—bought an older home in Los Altos Hills, California. After moving in they made the sort of discovery most of us can only dream about: descending into the 1000-bottle wine cellar, they found more than 300 bottles left behind by the former owner. The Jacksons presumed that the former owner believed the abandoned wines to be undrinkable. And in most cases (including—ouch!—dozens of bottles of 1934 Korbel champagne) that assumption turned out to be correct. 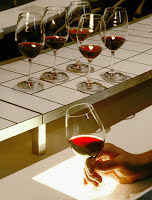 Some of the red wines had held up well enough, though, and were enjoyed by the couple and their friends over the years. 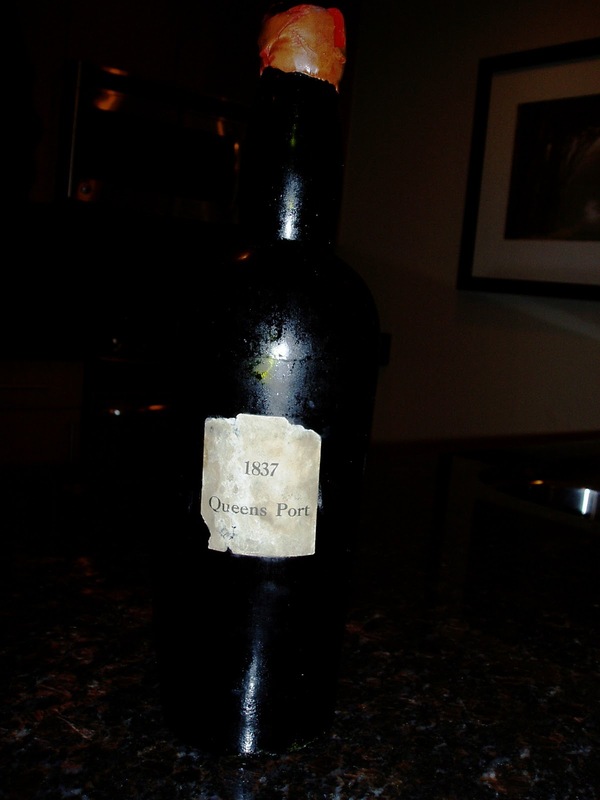 The cellar’s real prize: nine bottles of Port made around the mid-Nineteenth Century. The oldest bottles were dated 1837; the youngest, 1840. When Don and friends pulled the cork from the first bottle and took a tentative taste, the wine was still good. That’s surprising but not shocking because Port, as a fortified wine, can have a very long life. Good journalist that he is, Don delved into researching the Port. Unfortunately, the difficulty of doing such research in pre-Internet days was compounded by the fact that he possessed almost no information. 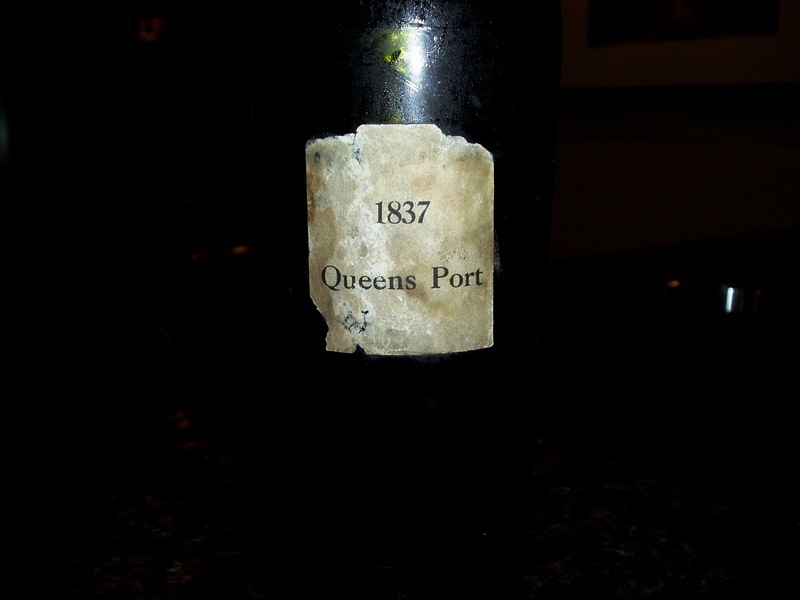 The labels, printed in black ink, provided only the date and the words “Queens Port” on the 1837 bottles and “PORT WINE” on the others. The bottles contained no seams and were obviously hand-blown, but had no identifying marks. The corks were sealed with wax, as all wines were long ago. In the end Don and Ann decided this was good advice, and they have enjoyed the Port ever since on special occasions or with certain friends who have a keen interest in Port or oenology. They started with the youngest Port (1840) and have slowly worked backward. Given the rarity of this treasure and their desire to share it with as many friends and family members as they could, they have tried to make every drop count. I knew nothing of this until last weekend, when Don, Ann, and I ended up in the town of Napa at an industry event. 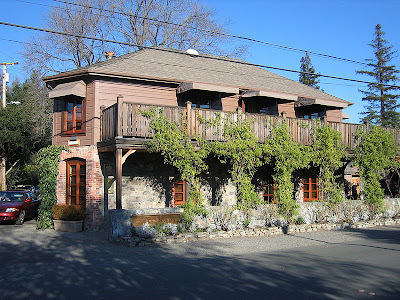 We chatted while waiting to board the Napa Valley Wine Train, and suddenly Don asked a question that rendered a schmoozer like me completely speechless: Would I care to return to their hotel room later to sample an 1837 Port? 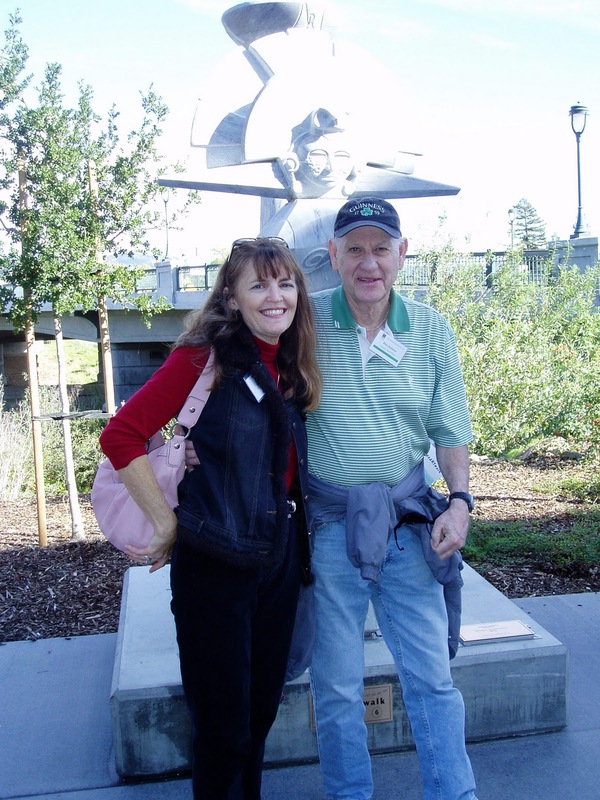 So later that night (along with our colleague, wine writer Bob Ecker), we stood around the granite kitchen counter in the couple’s room at the Napa Westin Verasa Hotel. Don explained that, when he had first opened the bottle we would sample, the cork had disintegrated. This is common with very old Ports, and meant that the black cork minutia must be filtered out before we could enjoy the wine. 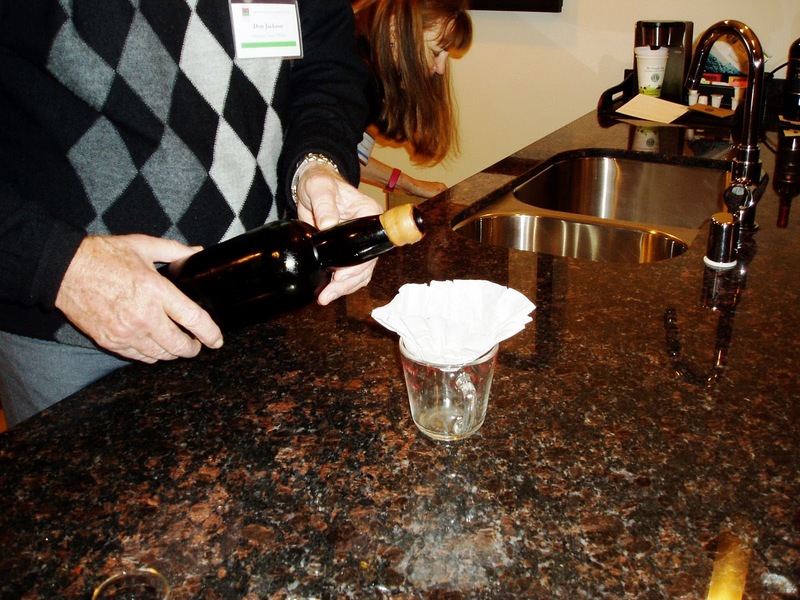 While Don slowly strained the wine through a Melita coffee filter, he told us that he believes it to be Vintage Port. 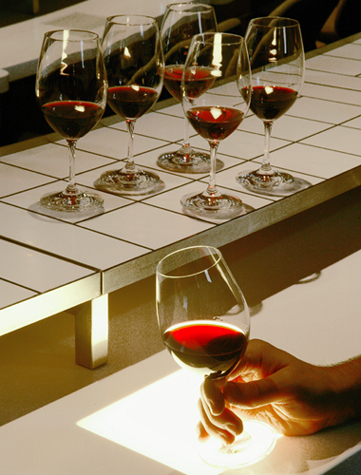 Sometimes referred to as “The King of Ports,” Vintage Port is only made in years when grapes are at their best. It matures in the bottle, improves with long cellaring, and is one of the longest-lived wines in the world. As I waited, I speculated about who had grown the grapes and made this wine 173 years ago. Very few Europeans lived in California at that time, so I doubted the Port had been made here (and surely a European, almost certainly a Brit, was responsible for labeling the wine “Queens Port”). It might have been produced on the East Coast or perhaps in Portugal, making its way ‘round the Horn at some point. After all, wine and spirits were popular trading items when ships traveled along California’s coast in pursuit of cow hides back in those days. Or maybe it made the journey later, over land, ending up in the wine cellar of a Gold Rush millionaire. But let’s return to the present: the filtration process was finished, having produced enough Port for each of us to have a small glass of perhaps six sips. I held my glass to the light: the Port was light-colored and slightly cloudy. The herbal aroma was faint, but the fact that it was still intact after 173 years made me smile. Finally I raised the glass to my lips and sipped that long-ago past. The taste was mild and harmonious, with a slight sweetness and a very pleasant mouth feel. The "Port-ness" had faded considerably so that it seemed almost, to my palate, like a light wine. Amazingly, it didn’t seem even remotely old or tired. Was it remarkable? No. Not in a technical sense. But to me that Port was glorious, and I’ll remember those few sips for the rest of my life. Empty the jar of olives into a strainer. Rinse the olives under cold water and set aside. Wash the jar and lid you’ve been using with hot, soapy water and also set that aside. Mix 3 cups of water and 1 tablespoon of Kosher salt in a small pan; bring to a boil and let salt dissolve. Let the mixture cool. Put the olives back in the clean jar. Fill the jar to the top with the salt mixture. 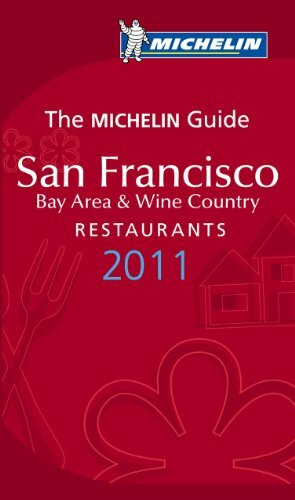 Set aside for three or four days in a cool place. Taste the olives. Do you like the taste, or do you feel they need a saltier brine? Either way, empty the water. You’ll now create a final brine, adjusting it to suit your taste. So if you want saltier olives, add more salt to the mix given above. Then let the brine cool before filling the jar. Store the olives from now on in the fridge. You'll make them delectable by using one or both of the alternatives below. The Simple-but-Luscious Olive Alternative: At this time you can add other things to the jar, such as lemon wedges, oregano, and/or slices of garlic. Some people add vinegar or lemon juice, and even olive oil, but I don’t. In fact, I just keep the olives in a plain brine. I love them that way, but I also jazz them up in small batches (see the next step). The Creative & Oh-So-Luscious Olive Alternative: Remove olives from the jar—let’s say a cup’s worth. Let your imagination run riot. For instance, you might marinate the olives in a mixture of olive oil, oregano, and garlic. Maybe you’ll throw in a dash of lemon juice or some thinly-sliced lemon rind, or even a dried chili pepper. 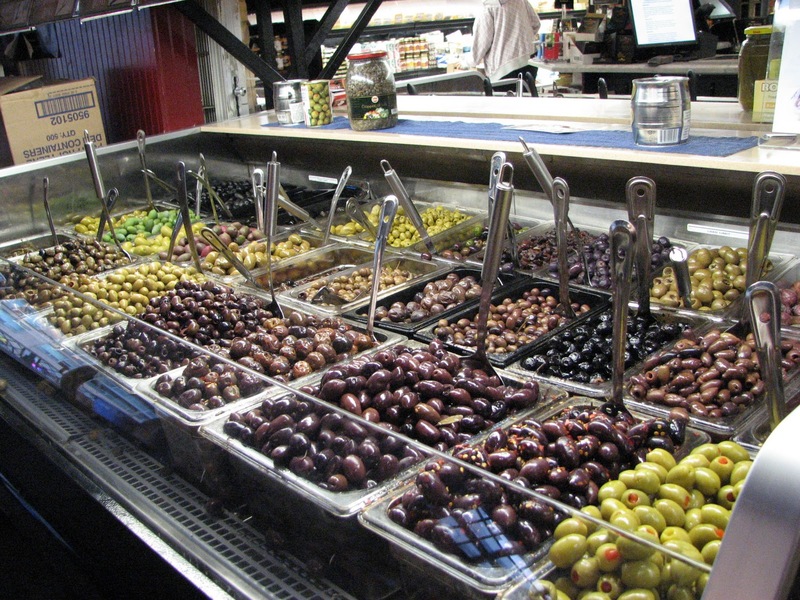 Let the olives sit at room temperature for a few hours, turning them around with a spoon every once in a while. They’ll be fab—and you get to tell your guests that you made them yourself! A caution: I usually make a few jars of these olives, munching them and giving them as gifts in little jars over the space of a month or so--that's how long they stay good in the fridge. After that they get soft and squishy, which I for one find incredibly unappetizing. So enjoy! The olives in Sonoma are just beginning to turn black, so in a couple of weeks I’ll create a batch of salt-cured olives. I love these for cooking. They store just great in the freezer, so I use them all year long. I’m just getting to the very end of last year’s batch and am ready for more. 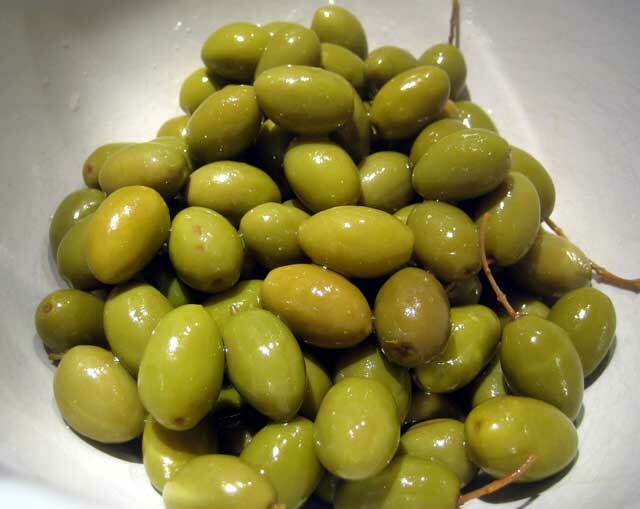 And if you love olives, you'll love this cookbook: Olives: More than 70 Delicious & Healthy Recipes.